Do you daydream a lot? Unfortunately, daydreaming is something that I have always battled with my whole life. Fortunately, every time I catch myself daydreaming or “goofing off” when I should be doing something constructive, I remember these words from Brian Tracy, “Successful people engage in activities that are goal-achieving.” This thought is taken from the article below by Mr. Tracy. I urge you to take a little time to read it. I make it a practice to read this article at least once a week to keep me on track for success. If you need a little bigger push than just an article, maybe you should get Brian’s The Miracle of Self-Discipline Package. It really will change your outlook on life. Good luck and make it a great day! There is one special quality that you can develop that will guarantee you greater success, accomplishment and happiness in life. Of a thousand principles for success developed over the ages, this one quality or practice will do more to assure that you accomplish wonderful things with your life than anything else. This quality is so important that, if you don’t develop it to a high degree, it is impossible for you to ever achieve what you are truly capable of achieving. The quality that I am talking about is the quality of self-discipline. It is a habit, a practice, a philosophy and a way of living. All successful men and women are highly disciplined in the important work that they do. All unsuccessful men and women are undisciplined and unable to control their behaviors and their appetites. And when you develop the same levels of high, personal discipline possessed by the most successful people in our society, you will very soon begin to achieve the same results that they do. All great success in life is preceded by long, sustained periods of focused effort on a single goal, the most important goal, with the determination to stay with it until it is complete. Throughout history, we find that every man or woman who achieved anything lasting and worthwhile, had engaged in long, often unappreciated hours, weeks, months and even years of concentrated, disciplined work, in a particular direction. Fortunately the quality of self-discipline is something that you can learn by continuous practice, over and over, until you master it. Once you have mastered the ability to delay gratification, the ability to discipline yourself to keep your attention focused on the most important task in front of you, there is virtually no goal that you cannot accomplish and no task that you cannot complete. 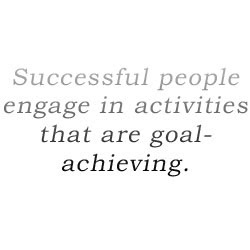 Successful people engage in activities that are goal-achieving. Unsuccessful people engage in activities that are tension-reliving. Successful people discipline themselves to have dinner before dessert. Unsuccessful people prefer to have dessert most of the time. Successful people plan their work, and work their plan. They take the time to think through their responsibilities before they begin. They make clear decisions which they then implement immediately. They get a lot more done in a shorter period of time than the average person. And it all has to do with their disciplines. Perhaps the most important benefit of self-discipline is the personal benefit that you receive. Every act of self-discipline increases your self-esteem. It gives you a feeling of personal power and accomplishment. Each time you discipline yourself to persist in the face of distractions, diversions, and disappointments, you feel better about yourself. As you continue to discipline yourself, you achieve more and more in life. As you achieve more things, you feel more like a winner. Your self-confidence goes up. You feel happier about yourself. You get more done and you have more energy. You earn the respect and esteem of the people around you. You get more rapid promotions and are paid more money. You live in a nicer house, drive a nicer car, and wear nicer clothes. You get a natural high from the thrill of achievement. And the more things that you achieve as the result of employing your personal habits of effectiveness and productivity, the more eager you are to achieve even higher and better tasks. Your life gets onto an upward spiral of success and happiness. You feel great about yourself most of the time. Every act of self-discipline strengthens every other discipline in your life. Every weakness of self-discipline weakens your other disciplines as well. When you make a habit of disciplining yourself in little things, like flossing your teeth every night, you’ll soon become able to discipline yourself to accomplish even larger things, like working long, long hours to bring a major task to completion. Your entire life is an on-going battle between the forces of doing what is right and necessary on the one hand and doing what is fun and easy on the other hand. It is a battle between the forces of discipline and the forces of ease or expediency. And when you develop the strength of character that gives you complete self-mastery, self-control and self-discipline, you feel wonderful about yourself. You develop a deep inner sense of strength and confidence. You replace positive thinking with positive knowing. You reach the point inside where you absolutely know that you can do whatever it takes to achieve any goal that you can set for yourself. Self-discipline is its own reward. Not only does it pay off in terms of greater self-esteem and a more positive mental attitude, but it pays off throughout your life in terms of the goals that you achieve and the success that you attain in everything you do. Self-discipline is a skill and a habit that can be learned by practice. Every time you practice a little self-discipline, you become stronger and stronger. Bit by bit, you become more capable of even greater disciplines. As you become a totally self-disciplined individual, your entire future opens up in front of you like a broad highway. Everything becomes possible for you and your future becomes unlimited.